slot) or hard disk. The control of the data stream is done automati- External clock input and output cally by the driver on interrupt request. The complete installed on- Using a dedicated connector a sampling clock can be fed in from board memory is used for buffer data, making the continuous an external system. Additionally it’s also possible to output the in- streaming extremely reliable. ternally used sampling clock on a separate connector to synchro- nize external equipment to this clock. Channel trigger The digitizers offer a wide variety of trigger modes. These include Reference clock a standard triggering mode based on a signals level and slope, like The option to use a precise that found in most oscilloscopes. It is also possible to define a win- external reference clock dow mode, with two trigger levels, that enables triggering when (normally 10 MHz) is nec- signals enter or exit the window. Each input has its own trigger cir- essary to synchronize the cuit which can be used to setup conditional triggers based on logi- instrument for high-quality cal AND/OR patterns. All trigger modes can be combined with a measurements with external equipment (like a signal source). It’s re-arming mode for accurate trigger recognition even on noisy sig- also possible to enhance the quality of the sampling clock in this nals. way. The driver automatically generates the requested sampling clock from the fed in reference clock. External trigger input All boards can be triggered using an external analog or digital sig- Star-Hub nal. It’s possible to use positive or negative edge. As two analog The star-hub is an additional comparators are used, one can also define a window trigger, a module allowing the phase sta- hysteresis trigger or a re-arm trigger. 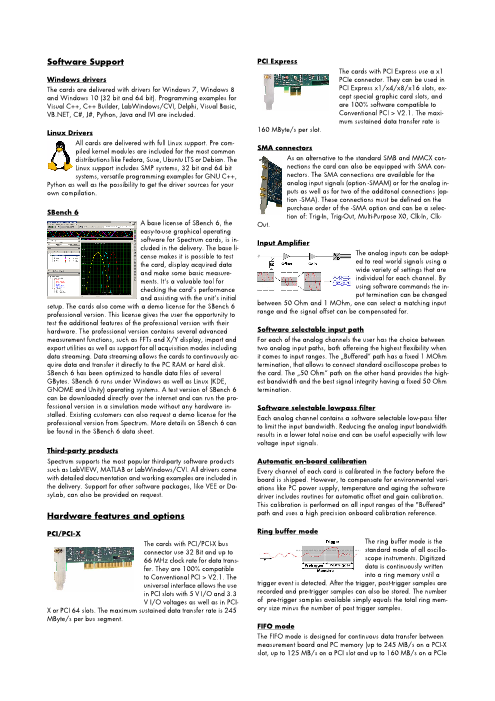 ble synchronisation of up to 8 boards of a kind in one system. 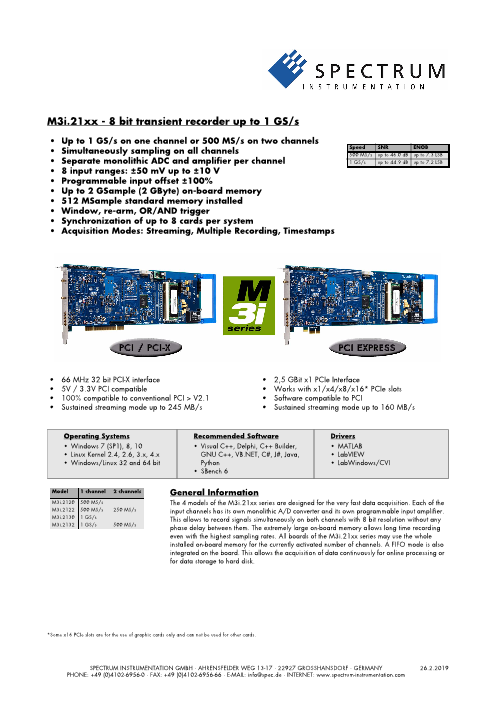 Universal Multi-Purpose I/Os Independent of the number of All M3i cards offer two universal multi-purpose boards there is no phase delay I/O lines, which can be separately programmed between all channels. The star- as either input or output. These lines can be used hub distributes trigger and as additional TTL trigger inputs for more complex clock information between all boards. As a result all connected trigger conditions. When used as outputs, these boards are running with the same clock and the same trigger. All lines can be used to output card status signals like trigger sources can be combined with a logical OR allowing all trigger-armed or to output the trigger to synchro- channels of all cards to be trigger source at the same time. nize external equipment. BaseXIO (Asynchronous I/O, enhanced timestamps) Multiple Recording The BaseXIO option offers 8 asynchro- The Multiple Recording nous digital I/O lines on the base card, mode allows the recording of which are available on a separate brack- several trigger events with an et as SMB connectors. The direction can extremely short re-arming be selected by software in groups of four. time. The hardware doesn’t This allows e.g. external equipment control or status monitoring. In need to be restarted in be- addition one of the I/O lines can be used as reference clock for the tween. The on-board memory is divided in several segments of the Timestamp counter. same size. Each of them is filled with data if a trigger event occurs. Pre- and posttrigger of the segments can be programmed. The num- External Amplifiers ber of acquired segments is only limited by the used memory and For the acquisition of extreme- is unlimited when using FIFO mode. ly small voltage levels with a high bandwidth a series of ex- ABA mode ternal amplifiers is available. The ABA mode com- Each of the one channel am- bines slow continuous plifiers is working with a fixed data recording with fast input impedance and allows - acquisition on trigger depending on the bandwidth events. The ABA mode - to select different amplifica- works like a slow data tion levels between x10 (20 logger combined with a dB) up to x1000 (60 dB). Us- fast digitizer. The exact ing the external amplifiers of the SPA series voltage levels in the uV position of the trigger events is stored as timestamps in an extra and mV area can be acquired. memory. Timestamp The timestamp function writes the time positions of the trigger events in an extra memory. The timestamps are relative to the start of record- ing, a defined zero time, ex- ternally synchronized to a radio clock, an IRIG-B a GPS receiver. Using the external synchronization gives a precise time relation for acquisitions of systems on different locations. PCI/PCI-X specific details PCI / PCI-X bus slot type 32 bit 33 MHz or 32 bit 66 MHz PCI / PCI-X bus slot compatibility 32/64 bit, 33-133 MHz, 3,3 V and 5 V I/O Sustained streaming mode > 245 MB/s (in a PCI-X slot clocked at 66 MHz or higher) PCI Express specific details PCIe slot type x1 Generation 1 PCIe slot compatibility x1/x4/x8/x16 (Some x16 PCIe slots are for graphic cards only and can not be used) Sustained streaming mode > 160 MB/s Certification, Compliance, Warranty EMC Immunity Compliant with CE Mark EMC Emission Compliant with CE Mark Product warranty 5 years starting with the day of delivery Software and firmware updates Life-time, free of charge Power Consumption PCI / PCI-X PCI EXPRESS 3.3 V 5 V Total 3.3V 12V Total M3i.21xx (512 MS memory) 2.3 A 2.3 A 19.1 W 0.4 A 2.0 A 25.3 W M3i.21xx (4 GSamples memory), max power 2.4 A 3.3 A 24.4 W 0.4 A 2.7 A 33.7 W MTBF MTBF 200000 hours Dynamic Parameters M3i.2130 and M3i.2132, 1 channel 1 GS/s (bandwidth 500 MHz) Input Path HF path, AC coupled, fixed 50 Ohm, full BW Buffered path, BW limit Buffered path, full BW Test signal frequency 9 MHz 40 MHz 70 MHz 9 MHz 9 MHz 40 MHz 70 MHz Input Range ±50mV ±100mV ±250mV ±500mV ±500mV ±500mV ±50mV ±250mV ±1V ±500mV ±500mV ±500mV RMS Noise (zero level) <0.5 <0.6 <0.5 <0.5 <0.4 THD (typ) (dB -54.1 -54.0 -54.1 -54.2 -54.2 -54.3 -53.8 -54.1 -53.8 -54.1 -54.4 -52.5 SNR (typ) (dB) 44.5 44.8 44.9 44.9 44.7 44.6 44.3 44.6 43.5 44.4 44.7 43.9 SFDR (typ), excl. harm. (dB) 62.4 63.4 64.3 62.7 59,5 56.4 62.1 62.9 50.7 53.1 54.5 52.2 SFDR (typ), incl. harm. (dB) 55.3 55.2 55.1 55.3 55.8 56.2 55.4 55.0 50.6 53.0 54.3 52.1 SINAD/THD+N (typ) (dB) 44.0 44.2 44.2 44.2 44.2 44.1 43.9 44.1 43.0 43.9 44.1 43.4 ENOB based on SINAD (bit) 7.0 7.1 7.1 7.1 7.0 7.0 7.0 7.0 6.9 7.0 7.0 6.9 ENOB based on SNR (bit) 7.1 7.1 7.2 7.2 7.1 7.1 7.1 7.1 6.9 7.1 7.1 7.0 M3i.2132, 2 channels 500 MS/s (bandwidth 500 MHz) Input Path HF path, AC coupled, fixed 50 Ohm, full BW Buffered path, BW limit Buffered path, full BW Test signal frequency 9 MHz 40 MHz 70 MHz 9 MHz 9 MHz 40 MHz 70 MHz Input Range ±50mV ±100mV ±250mV ±500mV ±500mV ±500mV ±50mV ±250mV ±1V ±500mV ±500mV ±500mV RMS Noise (zero level) <0.5 <0.6 <0.5 <0.5 <0.5 THD (typ) (dB -54.6 -54.6 -54.6 -55.5 -55.1 -54.9 -54.5 -54.6 -54.5 -54.6 -55.6 -53.0 SNR (typ) (dB) 44.9 45.4 45.5 45.1 45.0 44.9 44.7 45.0 44.7 45.4 45.2 45.3 SFDR (typ), excl. harm. (dB) 63.0 63.5 63.5 65.6 65.3 62.3 63.1 63.5 63.5 63.5 64.7 64.9 SFDR (typ), incl. harm. (dB) 55.9 55.9 55.9 59.0 58.5 56.7 56.0 56.0 56.1 58.2 58.9 56.3 SINAD/THD+N (typ) (dB) 44.4 44.9 44.9 44.7 44.6 44.4 44.2 44.5 44.3 44.9 44.8 44.6 ENOB based on SINAD (bit) 7.1 7.2 7.2 7.1 7.1 7.1 7.1 7.1 7.1 7.2 7.1 7.1 ENOB based on SNR (bit) 7.2 7.2 7.3 7.2 7.2 7.1 7.1 7.2 7.1 7.3 7.2 7.2 M3i.2120 and M3i.2122, 1 channel 500 MS/s or 2 channels 250 MS/s (bandwidth 250 MHz) Input Path HF path, AC coupled, fixed 50 Ohm, full BW Buffered path, BW limit Buffered path, full BW Test signal frequency 9 MHz 40 MHz 70 MHz 9 MHz 9 MHz 40 MHz 70 MHz Input Range ±50mV ±100mV ±250mV ±500mV ±500mV ±500mV ±50mV ±250mV ±1V ±500mV ±500mV ±500mV RMS Noise (zero level) (LSB) <0.4 <0.5 <0.4 <0.5 <0.4 THD (typ) (dB -54.2 -54.2 -54.2 -53.1 -51.7 -52.8 -54.1 -54.1 -54.1 -54.1 -62.4 -50.4 SNR (typ) (dB) 45.8 46.0 46.0 46.0 46.1 45.8 45.4 45.8 45.5 46.0 45.7 45.4 SFDR (typ), excl. harm. (dB) 63.1 63.3 63.3 61.2 64.4 60.8 63.0 63.2 63.2 63.3 63.5 60.3 SFDR (typ), incl. harm. (dB) 55.6 55.6 55.6 52.8 52.6 53.7 55.6 55.5 55.6 55.5 53.3 53.0 SINAD/THD+N (typ) (dB) 45.1 45.3 45.3 45.2 45.0 45.0 44.8 45.2 44.9 45.3 44.8 44.2 ENOB based on SINAD (bit) 7.2 7.2 7.2 7.2 7.2 7.2 7.1 7.2 7.2 7.2 7.2 7.1 ENOB based on SNR (bit) 7.3 7.3 7.4 7.3 7.3 7.3 7.2 7.3 7.3 7.3 7.3 7.3 A pure sine wave with > 99% amplitude of input range is measured with 50 ohms termination. SNR and RMS noise parameters may differ depending on the quality of the used PC. SNR = Signal to Noise Ratio, THD = Total Harmonic Distortion, SFDR = Spurious Free Dynamic Range, SINAD = Signal Noise and Distortion, ENOB = Effective Number of Bits. 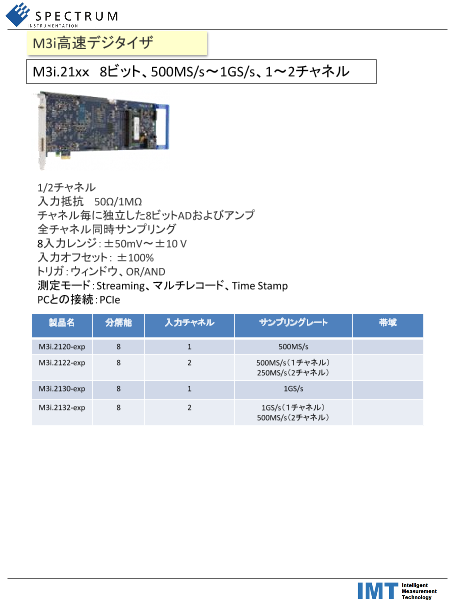 For a detailed description please see application note 002.